'The digital transformation of retail has started and it won’t stop,' expert says. E-commerce for fresh groceries is on the rise and while its development is still slow -- and operators are far from working profitably -- it’s a trend that’s not going to go away. Food producers, including seafood, need to be prepared for this next generation of shoppers, Dominik Große Holtforth of the E-Commerce Institute Cologne, Germany, told the audience at the salmon@baader event in Lübeck, Germany, Thursday last week. For the moment, classic distribution channels are still dominating but the online share is increasing. Große Holtforth predicted that 10 years down the line players such as Amazon Fresh will be established. Taking the example of the United States, where Amazon Fresh and Walmart are leading the online grocery field, he said “optimistic experts” are predicting a growth rate of 30 percent in market share to 2021. Overall grocery sales in the United States amounted to $795 billion (€682.6 billion) in 2016, which is expected to grow to $903 billion (€775.4 billion) within the next three years. In contrast, US shoppers spent $33 billion (€28.3 billion) for online food purchases in 2016, and this is expected to grow to $70 billion (€60.1 billion) by 2021. Amazon Fresh, which had a turnover of $8.7 billion (€7.5 billion) two years ago, with an online market share of 26 percent, could boost this figure to $23.3 billion (€20 billion), Große Holtforth said. He described this development as a “race of online groceries,” with bricks and mortar retailers such as Walmart venturing into online and Amazon going into groceries, reflected by the surprise acquisition of Whole Foods in 2017. Experiments around what will actually work online are still underway, however. 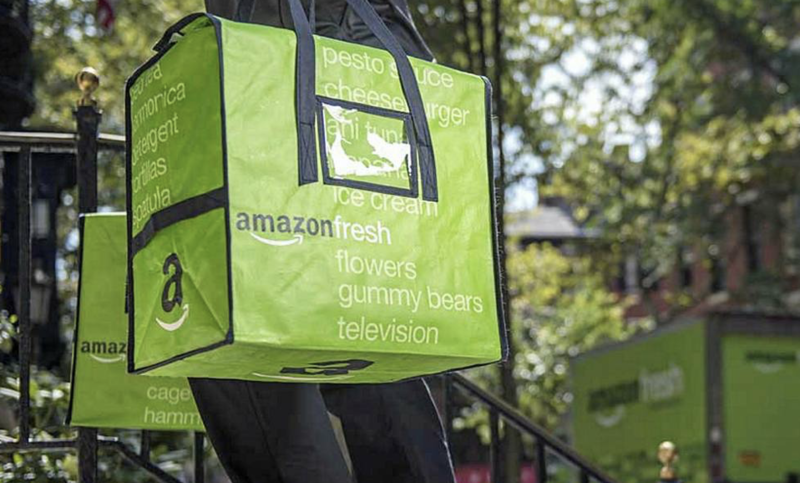 Will it be “pure players” such as Amazon Fresh, Ocado in the United Kingdom, or Picnic in The Netherlands, or will multi-channel retailers such as Walmart succeed? Große Holtforth said he is putting his money on Amazon Fresh emerging as the winner, simply because it’s a tech company, and because it’s difficult to bring bricks and mortar processes online. Amazon was built on the “Holy Trinity” principle: everything, cheap and fast. To live by this standard, the company has been collecting data since day one, which enables insights and analyses of processes and customer needs. But Amazon Fresh has been making a loss since it started in 2007, he said, which explains the $13.7 billion (€11.8 billion) acquisition of Whole Foods.“Amazon Fresh’s biggest competitor is Walmart and it recognized that it needs [offline] resources to compete,” he said. The company is rumored to be looking at acquiring German retailer Real, which is up for sale, in a similar move, and perhaps is targeting a retail acquisition in India next, he said. In Germany, Rewe is leading in the online sphere, while Amazon Fresh -- introduced in cities such as Berlin, Hamburg, Potsdam and Munich in 2017 -- is ranking third. Trust, he said is the main issue here, in addition to concerns about slow and unreliable shipping and higher prices, which result from logistical and distributional challenges. Acquiring Real in Germany could be a turning point, Große Holtforth said, to build up that trust with consumers, as well as the Amazon brand. So what does all this mean for seafood producers? That means cooperating with online retailers. In the case of Amazon Fresh that is either as a direct vendor to the retailer or on the marketplace with your own branded products. “Build your brand, make the Internet your center, work with Amazon and learn from them -- but don’t rely on them,” he suggested. “The digital transformation of retail has started and it won’t stop,” he said.